Governance, Risk and Compliance (GRC) is re-emerging as one of the most important components in the success of any company, the key to the integration of silos and the glue between the business and IT. Corporations, particularly those dealing with multiple jurisdictions, are facing an increasing number of regulations and internal policy requirements. To deliver a holistic view and manage performance, integrate departmental risk models and compliance needs, and understand the impact on company goals and strategy, a standards-based approach is a must-have. 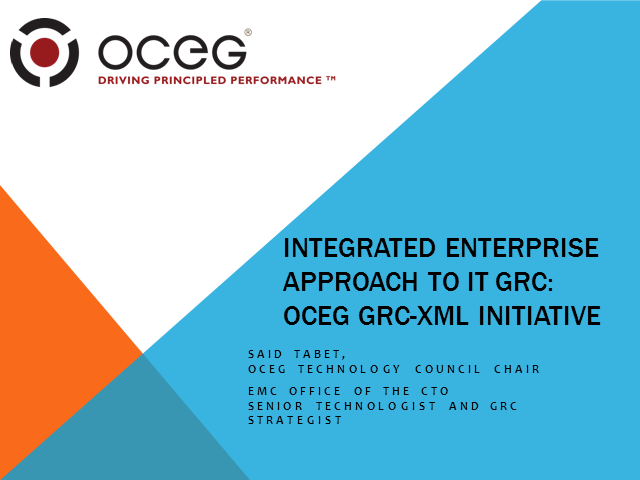 The GRC-XML working group is developing a standard and common language for the representation, sharing, and processing of governance, risk, and compliance information through the establishment of GRC Taxonomy based on XBRL and XBRL GL. The need for a common controls and risk language is present within a single organization as well as between an organization and its external auditors, government regulators, industry associations, and business partners. The market encompasses a broad spectrum of unique systems and solutions to address all aspects of an organization including its people, facilities, IT infrastructure, business applications, corporate responsibilities, legal, regulatory and financial obligations. One of the goals of the GRC-XML program is to enable these disparate systems to share and leverage information efficiently without compromising accuracy and functionality. In this webinar, we will address the issue of GRC and current trends and developments in the marketplace. We will provide an overview of GRC-XML and introduce some key use case scenarios to address GRC challenges, particularly in information technology (IT GRC) and enterprise integration. We will discuss the use of GRC-XML in Cloud Computing and the current effort extending GRC-XML to support Solvency II.